The cubic inch (symbol in3) is a unit of measurement for volume in the Imperial units and United States customary units systems. It is the volume of a cube with each of its three dimensions (length, width, and depth) being one inch long. The cubic inch and the cubic foot are still used as units of volume in the United States, although the common SI units of volume, the liter, milliliter, and cubic meter, are also used, especially in manufacturing and high technology. One cubic inch is approximately 16.387 mL. One cubic foot is equal to exactly 1,728 cubic inches because 123 = 1,728.
cubic in, cu inch, cu in, cui, CI, c.i. The cubic inch was established decades ago as the conventional unit in North America for measuring the volume of electrical boxes. Because of the extensive export of electrical equipment to other countries, some usage of the non-SI unit can be found outside North America. The cubic inch was formerly used by the automotive industry and aircraft industry in North America (through the early 1980s) to express the nominal engine displacement for the engines of new automobiles, trucks, aircraft, etc. The cubic inch is still used for this purpose in classic car collecting. The auto industry now uses liters for this purpose, while reciprocating engines used in commercial aircraft often have model numbers based on the cubic inch displacement. The fifth generation Ford Mustang has a Boss 302 version that reflects this heritage - with a five-liter (302 cubic inch) engine similar to the original Boss. Chevrolet has also revived this usage on its 427 Corvette. Dodge has a "Challenger 392" (a conversion from its 6.4 liter V8 engine). 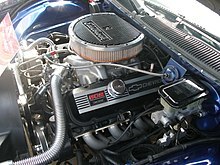 For more information and a list of cubic-inch-to-liter displacement conversions, see engine displacement.